Samsung Galaxy S5 SM-G900V (Verizon) 16GB 4G LTE GSM Free Smartphone - 3 Colors! Trending at $129.99eBay determines this price through a machine learned model of the product's sale prices within the last 90 days. The Device is Unlocked would work for Local and International GSM Carriers. UNLOCKED STATUS OF DEVICE APN Settings:The Device is Unlocked and may ask you for APN Settings for optimum performance for 4G LTE and MMS. · Samsung S5 G900a SmartPhone. · Samsung Li-ion Battery. · Battery Door Cover. · Data Cable. What is NOT included. Screen burn but 100% functional. The item will have heavy signs of use and scratches. Unlocked for GSM carrier. Samsung Galaxy S5. Network Unlocked. Family Line. Battery Capacity. GSM / GPRS / UMTS, HSPA . Trending at $46.50eBay determines this price through a machine learned model of the product's sale prices within the last 90 days. Samsung Galaxy S5 SM-G900V - 16GB Charcoal Black (Verizon/Unlocked) Smartphone Clean ESN (USED). Samsung Galaxy S5 SM-G900V - 16GB Charcoal Black (Verizon/Unlocked). Smartphone Clean ESN These Phones Has Minor Signs of Use! Trending at $155.00eBay determines this price through a machine learned model of the product's sale prices within the last 90 days. Samsung Galaxy S5 SM-G900V Verizon GSM Factory Unlocked Smartphone - with box! (These Galaxy S5's are graded 9/10 condition. Battery Door. Whats in the Box - These phones are NOT refurbished with cheap parts, everything is original. (Why are refurbs so bad?. Read below!). 2) Light to moderate scratching around charging port/USB cover/bezel. Run in the rain, camp in the desert, dig in your garden—all with your phone by your side. Whether you’re out in the sun or traveling by train, the 5.1" display will automatically adjust brightness and contrast levels to keep whatever you’re looking at vibrant, clear and rich with color. 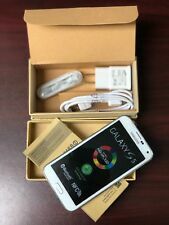 NEW SAMSUNG GALAXY S5 G900A AT&T UNLOCKED 4G GSM Android SmartPhone White. · Samsung S5 G900a SmartPhone. · Samsung Li-ion Battery. · Battery Door Cover. · Data Cable. What is NOT included. This is a GSM Network Unlocked Phone! - Network Unlocked. 1 x Samsung Phone Device. 1 x USB Data Cable. 100% Original. IS THIS A NEW PHONE?. This phone is inNEW condition.